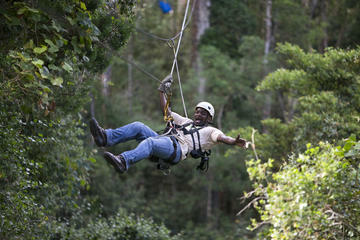 Fly through the treetops of the Tsitsikamma forest. This ancient collection of trees has long been cherished by local hikers but is now accessible to you through this exhilarating, family-friendly activity. Follow your local guide from one perch to the next, learning about the forest as you explore. You are guaranteed to feel like Tarzan swinging from tree to tree! To begin, you are briefed with a safety talk. Here you are provided with all the necessary gear and taught exactly what you will need to do. You will then head into the forest for the start of the canopy tour. As you enter the forest, look up at the immense ancient trees on either, in a minute you will be up there. With 10 platforms, some 30m above the ground, this tour may aggravate a few nerves. These nerves do not generally last. This is not only because you will be having an immense amount of fun, but also because it quickly becomes clear that your guide values safety above everything else. Furthermore, your local guides will also educate you on your surroundings. Don’t worry, you are not walking into a lecture, just a few fun facts. This was one of my favourite thing to do while in Tsitsikamma. A must do and see!!!! The staff were amazing and this was an experience I will never forget. However, if you are terrified of heights don’t do it. I didn’t realise I was until I had done the first zipwire. Then its too late to go back. The staff were brilliant at managing my fears. My experience only though as my hubby loved it. Professional organisation. Lovely activity enjoyed by my 11 year old, 17 year old and myself. That was exhilarating, but controlled and safe! Also the forest is amazingly beautiful.